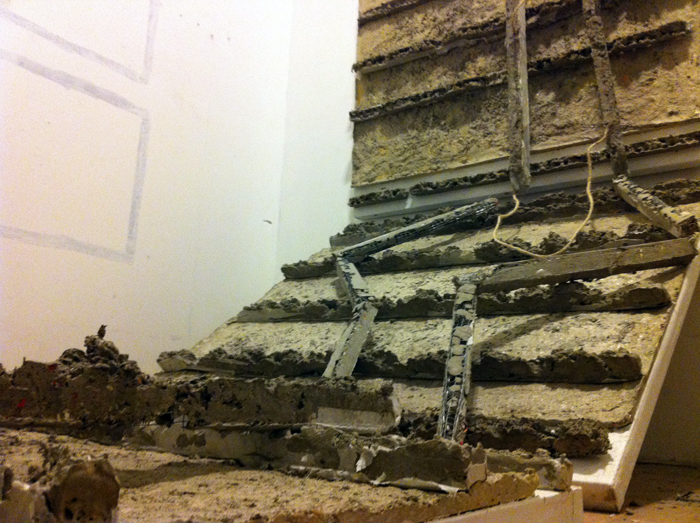 Work in Progress, this is a detail from Linear Anagram, Installation Three. 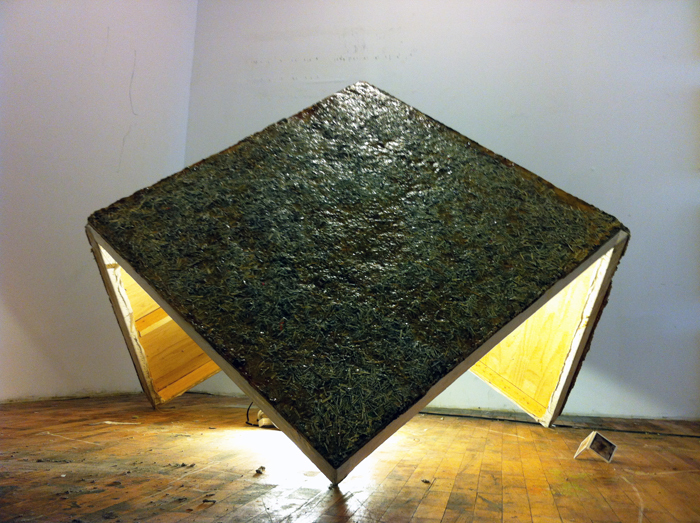 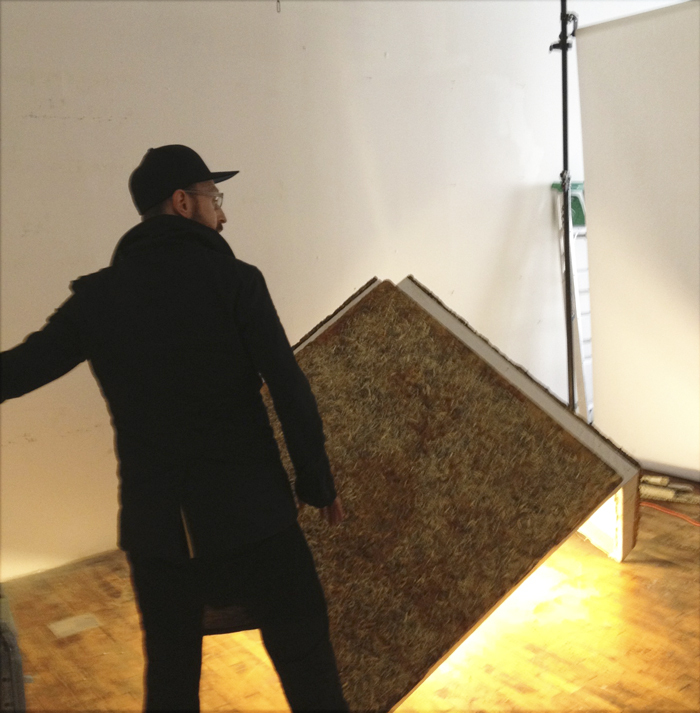 Each of the three pieces that comprise this pyramid is 4'x4.' 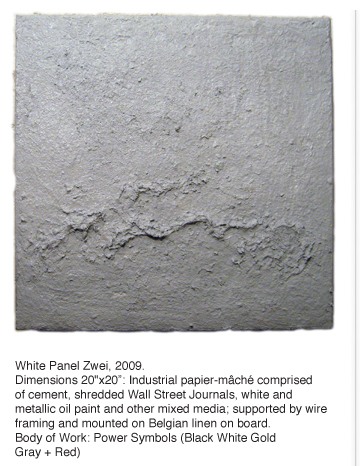 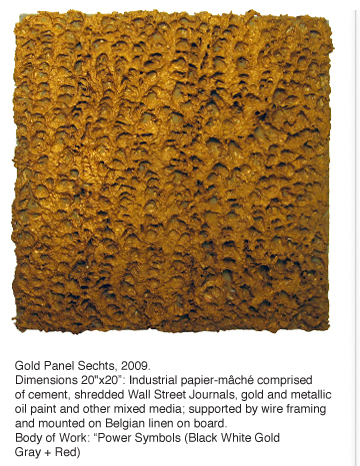 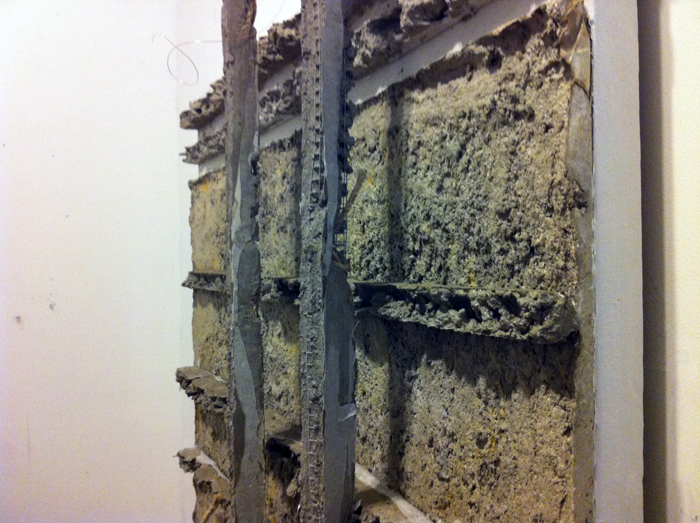 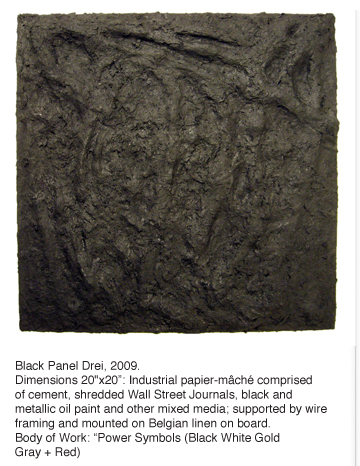 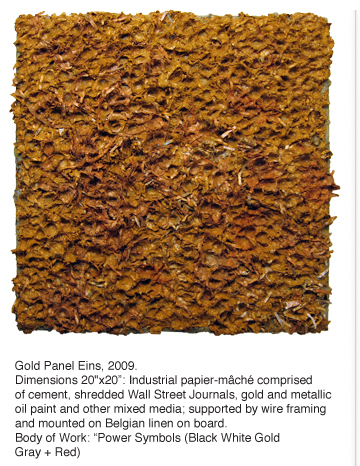 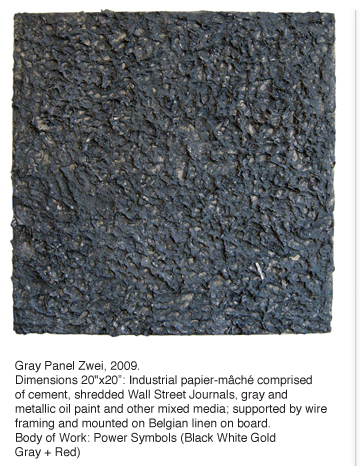 The composition of the installation is "industrial papier-mâché," comprised of cement and shredded documents on linen on board. 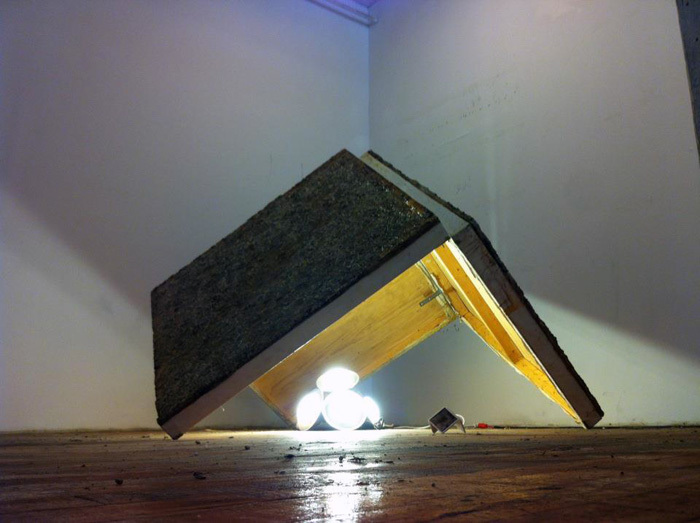 What you can’t experience via the photograph is that embedded in the lighting box that radiates light from the floor are iPods with miniature speakers playing chant recordings of the same phrases of the shredded documents in the piece. 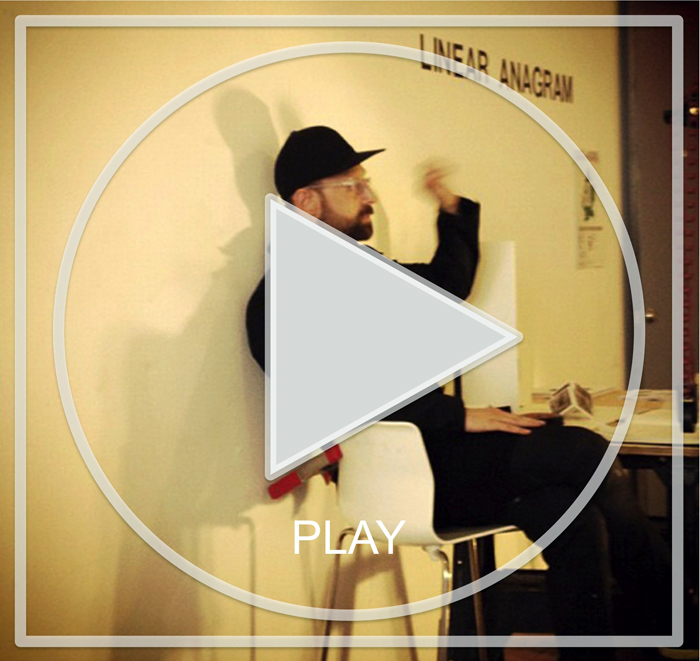 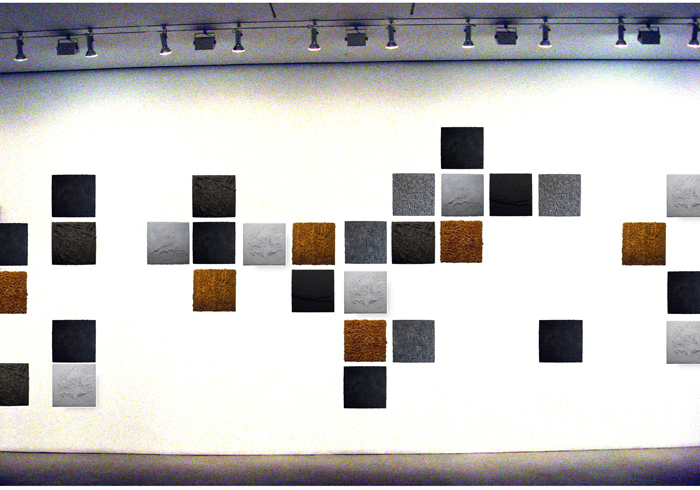 Alternate View of Linear Anagram, Installation Three. 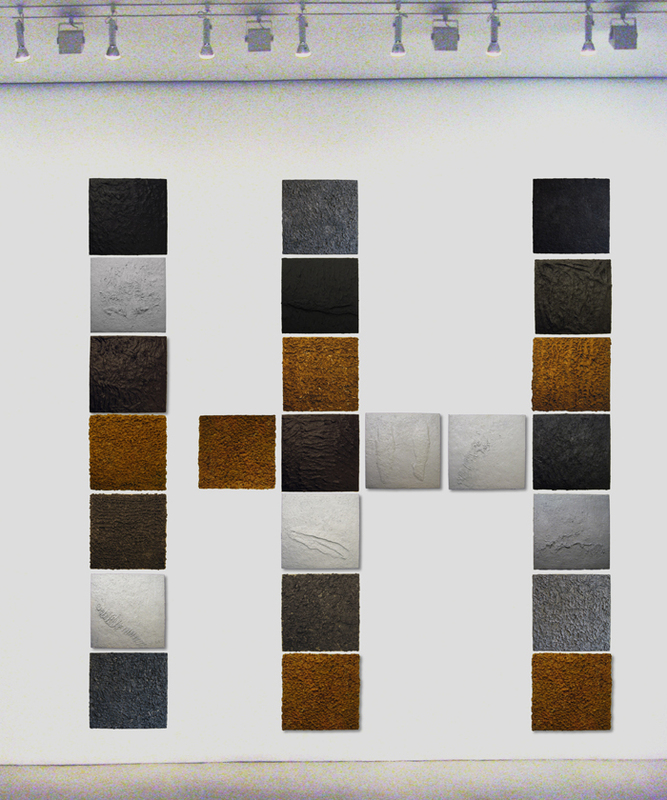 Work in Progress, this is a detail from Linear Anagram, Installation One. 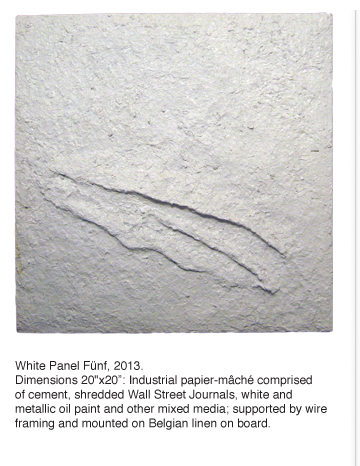 Each of the three pieces arcing from the wall to the ceiling is 4'x4.' 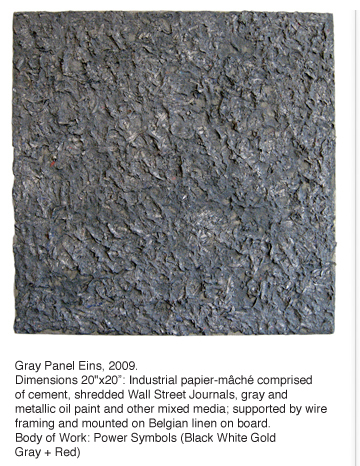 The composition of the installation is "industrial papier-mâché," comprised of cement and shredded documents on linen on board. 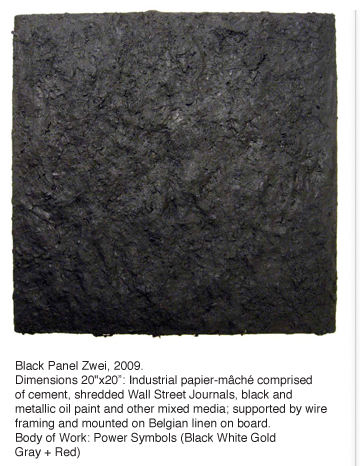 Power Symbols (Black White Gold Gray +Red) Installation FIVE (5). 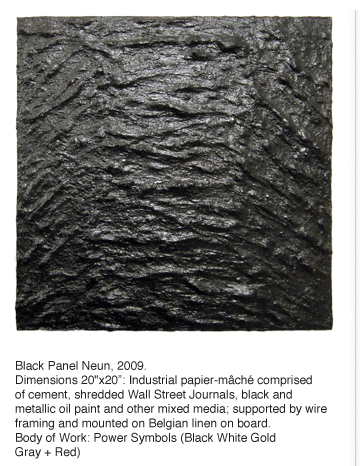 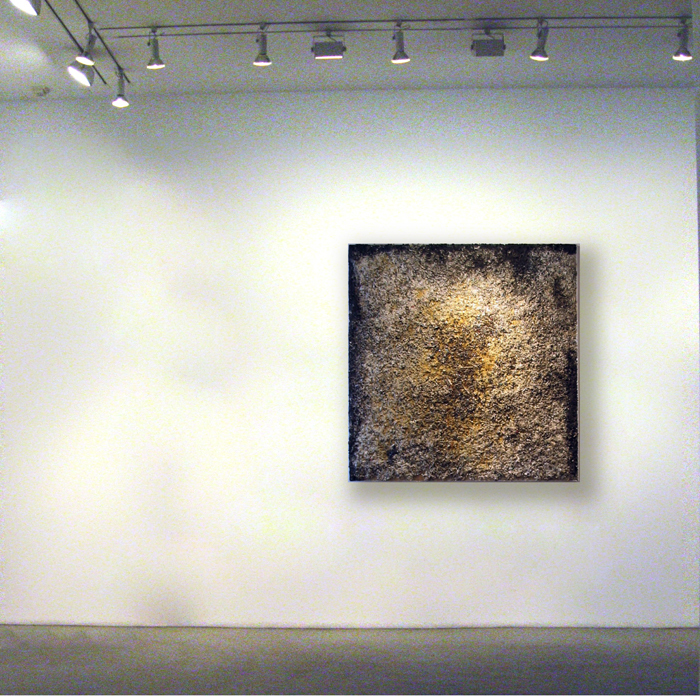 13'8"x12'6" (164"x150"): comprised of twenty-four 20"x20" monochromes (6 black, 6 white, 6 gold, 6 gray); industrial papier-mâché produced from cement and shredded financial documents, and finished with oil and varnish washes; supported by wire framing and mounted on canvas on board. 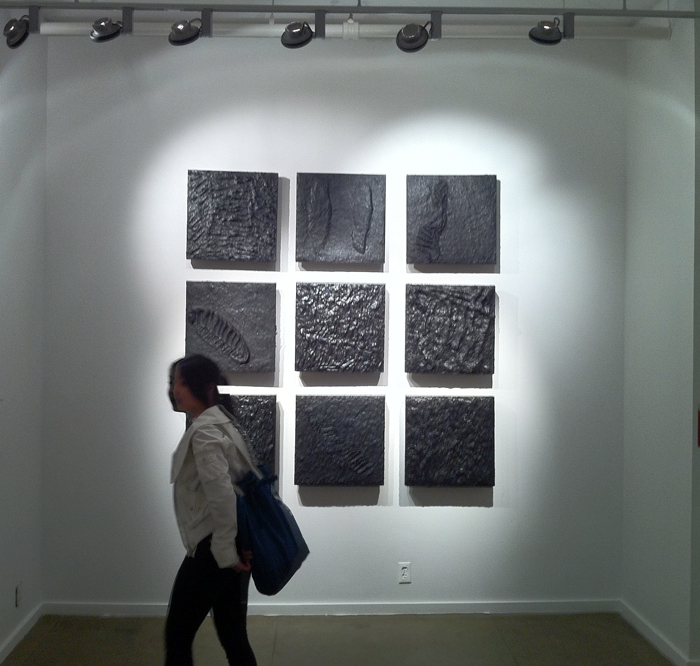 Power Symbols (Black White Gold Gray +Red) Installation TWO (2) with partial views of installations 1 and 3. 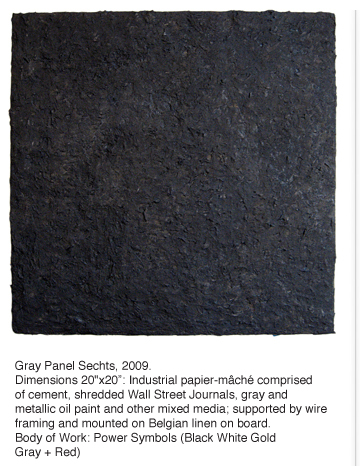 Each individual monochrome is 20”x20,” and comprised of cement, shredded financial documents, oil and mixed media on linen on board. 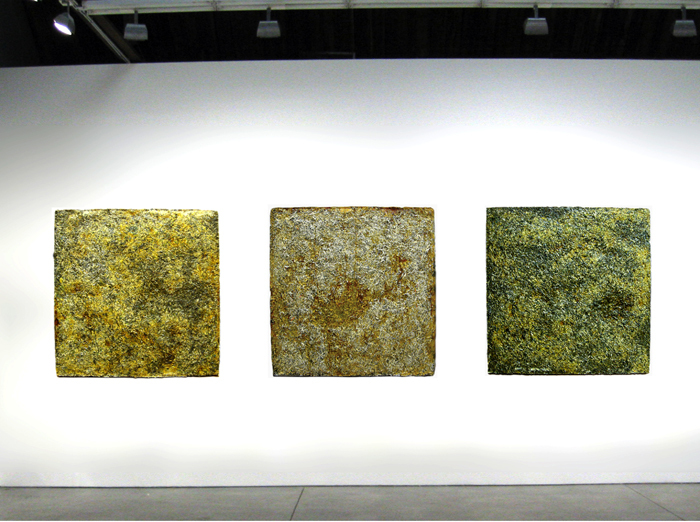 Corporation (Potent), 2006. 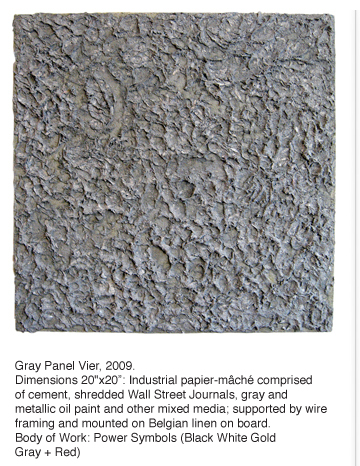 48"x48": industrial papier-mâché produced from cement and 3 years of shredded corporate financial documents, and finished with oil and varnish washes; supported by wire framing and mounted on canvas on board (160lbs). Ecdysis, 2001. 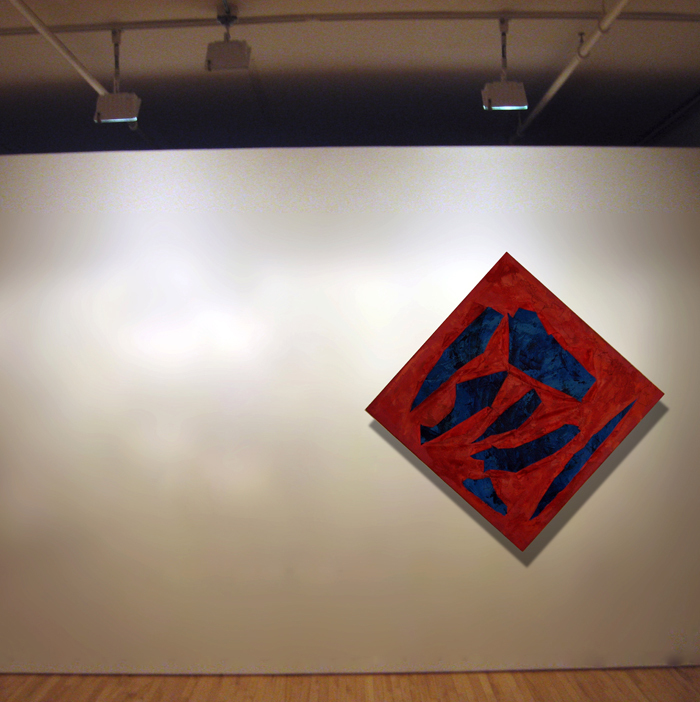 48"x48" diagonal: oil and acrylic on canvas with cut-outs affixed by wire to oil and acrylic on canvas. 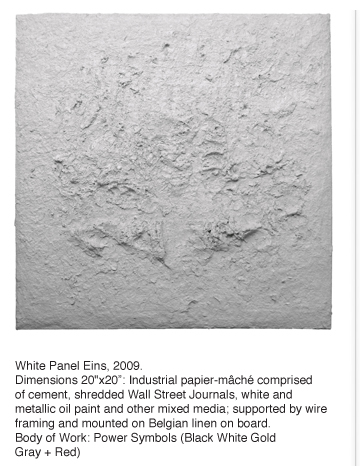 Themes Explored: sexual and emotional emancipation, self-loathing and self-destructive behavior, exorcism, internal and external struggles.